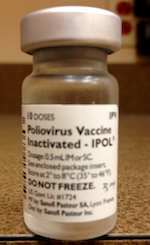 IPV stands for injected polio vaccine. The first polio vaccine was released in 1955. In the United States, we only use the injected vaccine as the oral vaccine has more side effects. Local reaction is the only likely reaction with the IPV. I have never seen a case of polio, but it is still present in the world.